Our experts will help you select a Summer or all season tire to suit your vehicle and travel requirements. Our pricing is always competitive and in most cases we can match or beat competitors pricing. We value your business and as such provide honest service and quality work. Yokohama Summer Tire Promotion on Now! 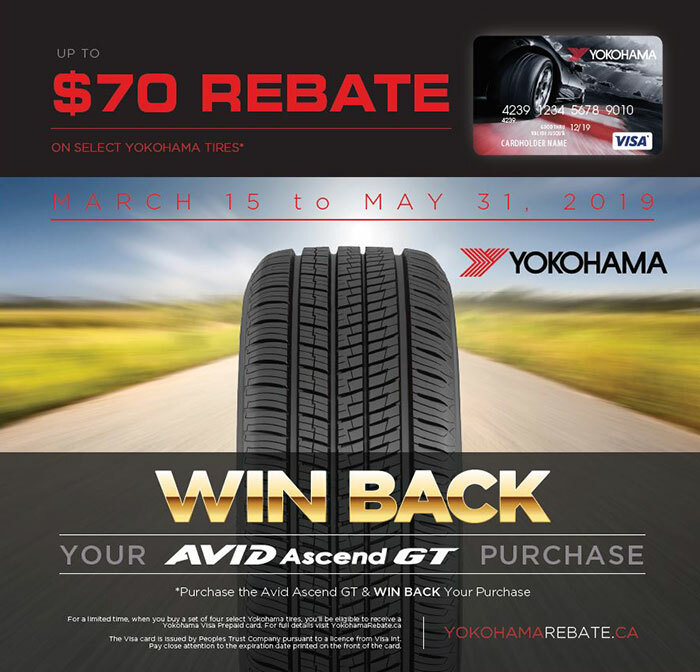 Get up to $70 in rebates from March 15 – May 31, 2019 when you buy 4 select all-season Yokohama Tires. Download the Rebate form - Click here. Click here to request a quote for Summer tires. One of the most important aspects of your vehicles are your tires. Tires come in three variations, All Season, Winter & Summer. There are "4-Season" tires but we would caution you against using those in our region! We offer a Senior's Discount and Free Pickup and Dropoff in the north-end of Peterborough. Autocare Signature Tire is an authorized tire dealer for nearly all major manufacturers, we offer some of the best deals in town.